Cozy into this casual upholstered arm chair for superior comfort. Extra wide chair and 1/2 size makes for a spacious seat perfect for lounging. 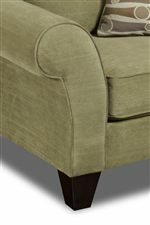 Generously stuffed seat back and cushion is filled with long-lasting foam and fiber for durable support. Curved rolled arms and thick, exposed feet add elegant flair. Available in a variety of fabric options to match with any room in your home. The D02 Casual Plush Rolled Arm Chair and 1/2 with Exposed Tapered Feet by Bauhaus at Reeds Furniture in the Los Angeles, Thousand Oaks, Simi Valley, Agoura Hills, Woodland Hills, California area. Product availability may vary. Contact us for the most current availability on this product. Bring casual, plush seating to your home with this pleasant sofa & chair set. Gently rolled arms beckon for you to snuggle into the generously stuffed seat cushions for a cozy experience. High quality fiber and foam padding ensure long-lasting support and durability. Exposed tapered feet add a solid, clean touch to this homey set. Available in a large variety of fabrics, you can customize this sofa and chair set to match with any home decor. The D02 collection is a great option if you are looking for Casual furniture in the Los Angeles, Thousand Oaks, Simi Valley, Agoura Hills, Woodland Hills, California area. Browse other items in the D02 collection from Reeds Furniture in the Los Angeles, Thousand Oaks, Simi Valley, Agoura Hills, Woodland Hills, California area.